What VR video player do you use? View Poll Results: What Video Player do you use? Hey guys, do you use VR player? 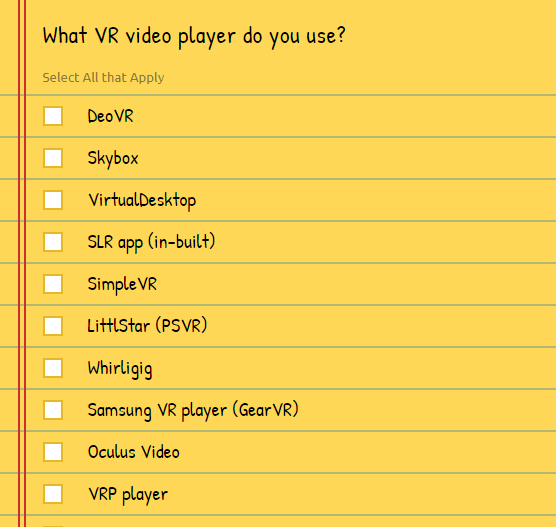 Found poll about VR players, please take a look and leave your voice here. Interesting to see results of as many people as it is possible. If you would like I can add a poll to this thread, the VBVBVB$software$ $allows$ $for$ $built$ $in$ $polls$. Anyone have a "comprehensive" recommendation? PSA: How to avoid nausea while using your Daydream View! Why is my Galaxy S6 overheating after 10-15 minutes of use in Gear VR?